YOU WILL NEVER LOOK AT OR TOUCH YOUR HORSE THE SAME WAY AGAIN! This is the most extensive, professional and recreational based equine massage training in North America. This course is a wonderful investment in your future. The massage awareness method will allow you to, in a natural, actively participate way to the health and fitness of horses. Work you way through the practical guide and watch the dvds a number of times to reinforce what you have learned, then practice your movements, routines and techniques on a horse. For your academic studying, one to two hours study sessions work best. It is easier and faster to learn and absorb little sections at a time than too large ones at once. For your manual practice sessions, two-three hours sessions work best. Because of the excitement triggered by the learning of this material, during your hands-on sessions remember not to rush. To get the best out of the massage awareness method we recommend you to focus your first 2 to 3 months of academic studying on the chapter 1, 2, 3, 6 and your hands-on practicum on your posture, your pressure, contact and rhythm. Start practising the relaxation massage routine from chapter 9 as it is the prelude to nay massage work; then practice the SEW / WES technique from chapter 8 as it is the foundation of your work. You need to know how to properly warm-up an area to be massaged and you need to how to properly drain that area after your deeper massage. As you progress start practising the various other techniques (chapter 8) and routines (chapter 9). Within three month you should feel petty comfortable in your hands-on as well as in your knowledge of your dog’s anatomy. Move on to learn about the various stress sites of the active dog as presented in chapter 10, 11, 12 and add the use of heat and cold in your massage application. Also, start keeping record as shown in chapter 13. You can take this course chapter per chapter, as it is presented in the book, or you might consider studying the animal section per section. For example spend your first couple weeks studying thoroughly the head and neck part of the horse, its skeleton, its joints and ligaments, its deep and superficial muscle layer, its related stress points, etc..... Then, when you feel good and solid about this part, move on to the shoulder and foreleg structures in the same fashion for the next couple weeks. Then, the back section and finally the hip and hindquarters. Within a couple month you should have absorb most of your anatomical knowledge and that is good as it is the foundation of your work. The more you know the structures you work on the better the results. Be aware not to burn yourself out in the first month. This equine massage knowledge is with you for life. Enjoy the learning process. Relax, take lots of deep breathes and smile. With this course you start a new life. Be patient in your learning process as everything takes time to mature. With this material you will absorb knowledge that as been developed by some of the wisest in the profession. This home study course will take you in the sunlight of equine massage practice and, combined with your instinct as a horse person, you will soon be very confident in your application of equine massage. 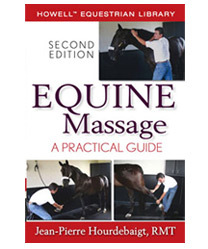 Chapters 11 to14 included in the revised edition of the Equine Massage, A Practical Guide book, are not part of the Equine massage foundation course. They are provided as atonements for your practice. Please consult our list of Continual Education Courses if you wish to further your education in these related fields. At this point I want to personally thank you for helping horses around you with massage. Once you have completed the Home-study portion of the Equine Massage Foundation course and feel you are ready for more detailed professional information, I will be glad to assist you in furthering your massage skills when you register in the Practical Training Session (PTS). During this PTS, I will refine the movements and techniques you have studied on your own, teach you new tips and hints of the professional trade and test your abilities before you receive your Certificate of Completion from our services. This Equine Massage Foundation course is endorsed by the NCBTMB and is accredited for 50 CEUs.